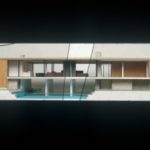 Mies Van Der Rohe, Resor House (a.k.a. Snake River Ranch), Moose Wilson Road, Jackson Hole, Teton County, Wyoming, USA, 1943. 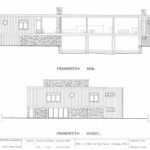 In 1937 Mies was engaged to design a summer house in Wyoming for Helen Resor (Museum of Modern Art trustee and advertising executive) and her husband. 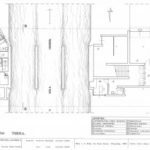 The house was to be built over a man-made stream flowing from the Snake River. Floor-to-ceiling glazing, previously used by Mies in Europe in the Tugendhat House and the German Pavilion for the International Exposition in Barcelona, enclosed both sides of the main room. 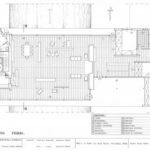 Mies also made an interior architecture out of the placement of furniture and the positioning of murals and freestanding painting. 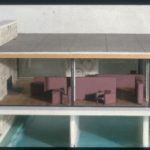 Mies’ design of the house went hand in hand with his choice of materials: unpainted reddish black cypress boards for the exterior cladding as well as the interior walls, ceilings, and doors of the upper floor and service wing; and a pinkish native fieldstone for the walls on the ground level, the fireplace wall, and the central stairway. 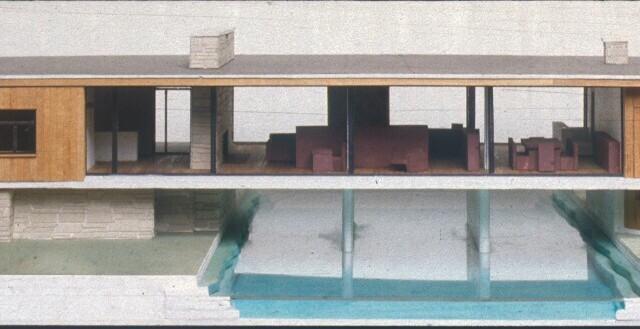 This was the first and only project for which Mies proposed wood as a cladding material, and here he represented a kind of American skin to cover the modernist skeleton of his construction. Van der Rohe, Mies Ludwig. 1992. The Mies van der Rohe archive: [an illustrated catalogue of the Mies van der Rohe drawings in the Museum of modern art]. 7: Resor House. London, New York: Garland.